Natural horsemanship – or what is commonly referred to as ‘horse whispering’ invites profound learning around how to lead others. It is experiential learning at its best and there is almost no limit to the take home benefits on offer through this engaging morning. Situated in the tranquil Dargle area of the KZN Midlands, this experience can form part of your breakaway or simply be something different that you decide to do with your team. Combining the well-qualified insights of Carlene Bronner and the leadership experience within TomorrowToday, the morning paints the future context for leadership and then presents practical lessons and feedback on one’s own leadership style and engagement. It is a morning that offers ‘serious fun’ when it comes to learning more about oneself and leadership. The Horse Whispering: Learning about Leadership begins with a welcoming mug of coffee and snacks before ‘Horse Whisperer’ Carlene Bronner (on who’s farm the experience takes place) introduces the participants to the concept and the horses. Carlene has studied the practice of natural horsemanship overseas and is one of South Africa’s most qualified experts in this area. The morning offers a complete hands-on engagement with the horses and there is no riding involved. On most courses there is someone who has never even touched a horse and often someone who has had a bad experience with a horse and so arrives very apprehensive about what is to come. Carlene takes all this into consideration and by the end of the morning there is never anyone who hasn’t made significant progress in their own understanding and engagement with horses. It is in this process where the ‘magic’ is found as participants learn how to connect with their horse and build a trusting relationship that enables them to effectively lead their horse. Tasks are accomplished at the end of the morning that seemed utterly impossible at the outset. This process – of connection, building a trusting relationship and leading, invites profound leadership insights. These insights are highlighted and the focus becomes how best to apply these insights and learning to one’s own leadership practice as well as to the leadership culture within the team / organisation. This form of experiential learning tends to make a deep impact on the learner and judging by the feedback, the insights gained translate into real behavioural change in the workplace. The morning ends with a superb lunch with a roaring fire (in winter). 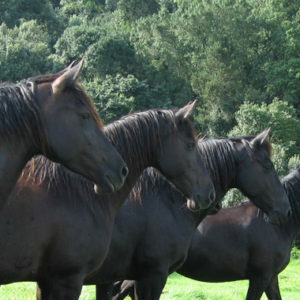 Horse Whispering: Learning about Leadership has been incorporated into several corporate leadership development programmes and has been used by executive and management teams, within talent management programmes and as part of breakaway sessions. In so far as it applies to leadership, this is an experiential learning exercise that was pioneered by TomorrowToday and Carlene Bronner in South Africa and possibly globally.